If it feels like things have been shaking up in the cosmos lately it’s because they have. We’ve experienced the Spring Equinox, Mercury retrograde and the beginning of Aries season. Aries is a sign full of passion, action and momentum - it’s a fire sign - expect some introspection and deep thinking coupled with that boldness this New Moon. Without further adieu - our New Moon reading from Violet Guide. Alright, this reading is all about the arrow - visualize an arrow of career and dreams shooting forward! Time to level up this New Moon! We kick it off with the Eight of Pentacles and The Star Card. It is time to really lean into your natural skillmanship and craft. Where does your natural power lie? Let it rip with the support of the light and experience that feeling of positivity back into your body! It is action time with your dreams! Wake up and dust off that winter vibe. The Star in you is ready to be birthed! It is time to pull your arrow out to aim and fire! The first step in this self launching is examining The Hanged Man and Son of Swords within your energy field. LETTING GO is the name of the game and the mastery of unattachment. The Son of Swords pulls the energy of being forceful and determined and a masculine energy of action. Trust what you have learned and take the wisdom and cross over into letting it fuel your work now. The body of your arrow is The Mother of Pentacles, the Two of Wands and The Strength Card. Wow, this is absolutely stunning energy that we have achieved. It is showing that we have been creating a safe place to love and nurture the inner child. You have graduated in giving yourself empathy, healing yourself. This launch is focused on your new path and you have nothing but the badge of strength that you have earned in facing your pain! The cutting arrow is Death and the Ace of Cups. Damn. You have faced your own death and are taking on the power of a new beginning with a new community. New LOVE begins and enters seen. We are physically seeing this as we cross into Spring with the death of winter into the blooming of flowers. 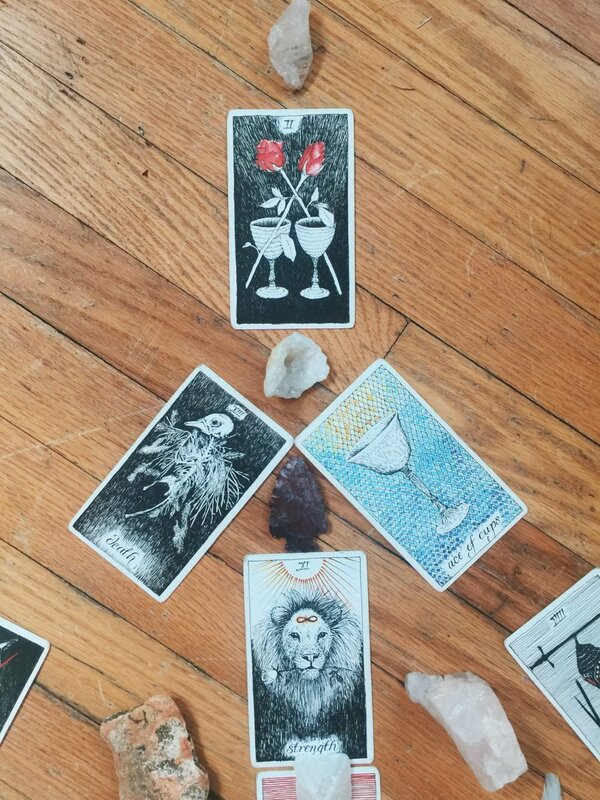 The energy that pushes out is seeing our sweet friend the Two of Cups, which is romance, connection and pure friendships being produced from this new vision and space inside of yourself. Take a pause and give notice to how the Father of Swords and the Four of Swords have manifested in your body, mind and spirit. The Father of Swords is fair and analytical with the gift of understanding perception. It’s tied to when we allow ourselves to sit in stillness with our mental power. Rest and meditate on what you have learned; consider that you are pulling through and now let it be a drive for your dreams. The other side is the Eight of Swords with the Four of Pentacles. Pause and reflect on where you felt trapped and powerless and found yourself as the victim. We are now trading out that energy and going through a growth spurt of the Four of Pentacles where there may have been a feeling of possessiveness. We are bringing that energy out of our bodies to bring that controlling feeling to its final death. The trade of the Ace of Cups is manifesting to your full potential! Words and images by Violet Guide.